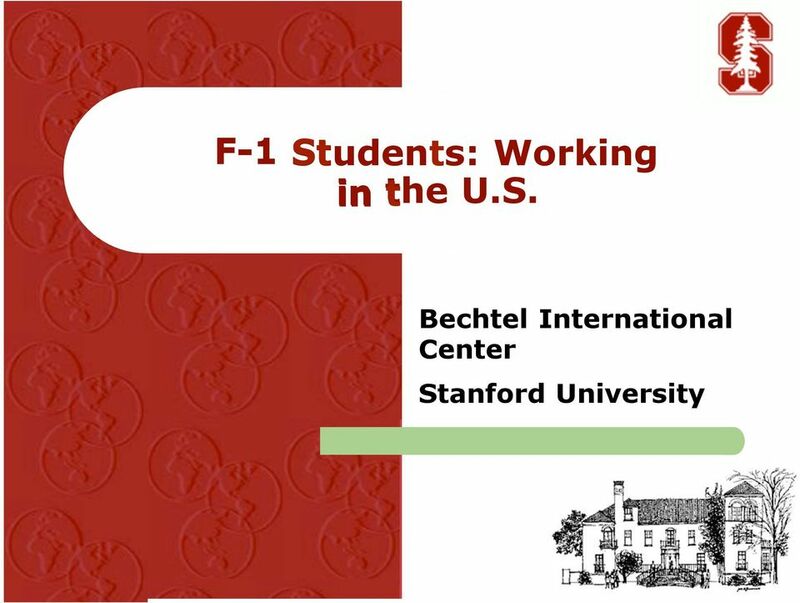 Download "F-1 Students: Working. 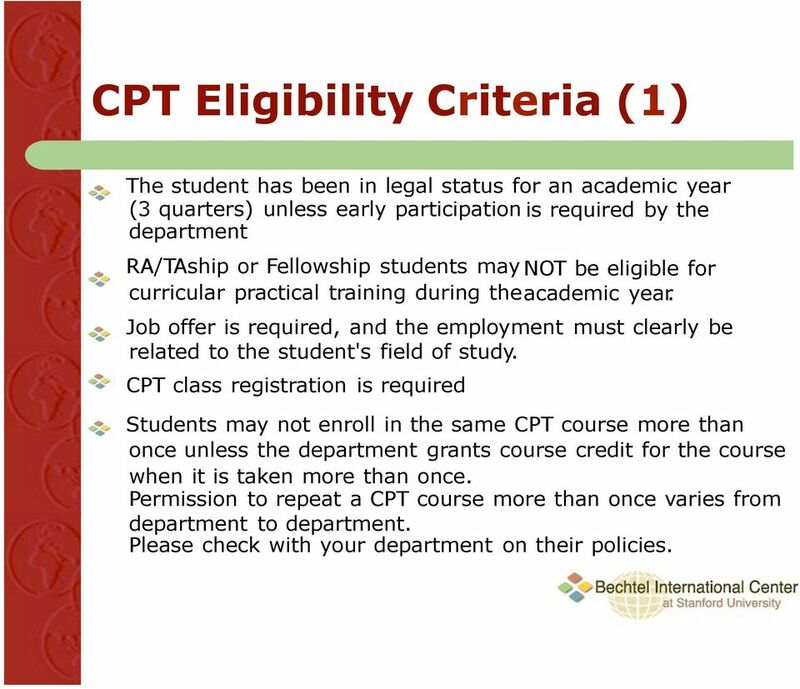 Bechtel International Center Stanford University"
8 CPT Eligibility Criteria (1) The student has been in legal status for an academic year (3 quarters) unless early participation is required by the department RA/TAship or Fellowship students may NOT be eligible for curricular practical training during the academic year. Job offer is required, and the employment must clearly be related to the student's field of study. 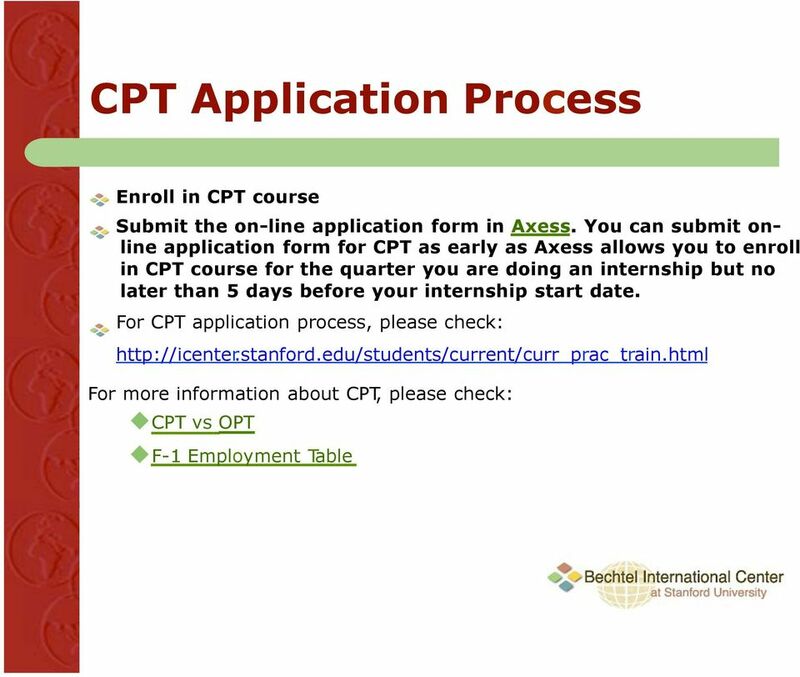 CPT class registration is required Students may not enroll in the same CPT course more than once unless the department grants course credit for the course when it is taken more than once. 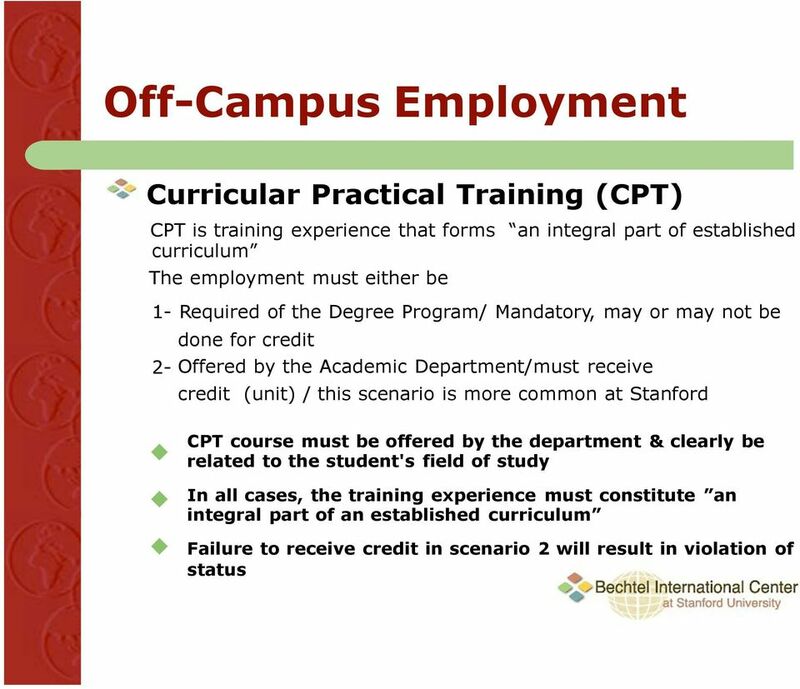 Permission to repeat a CPT course more than once varies from department to department. Please check with your department on their policies. 13 Off-Campus Employment Pre-Completion OPT A student who still has coursework remaining to complete his/her degree program may apply for Pre-Completion OPT This can be: u Part-time during School Session (<=20 Hours) u Full-time during school official holidays (>20 hours a week) All pre-completion OPT time is counted towards the 12 (or 29) month maximum Part-time OPT is deducted at a 50% rate. 14 Off-Campus Employment Pre-Completion OPT for TGR students A student who has completed all course requirements for the degree, but not completed the thesis/dissertation or equivalent (TGR), may apply for full-time or part-time Thesis-Pending OPT. 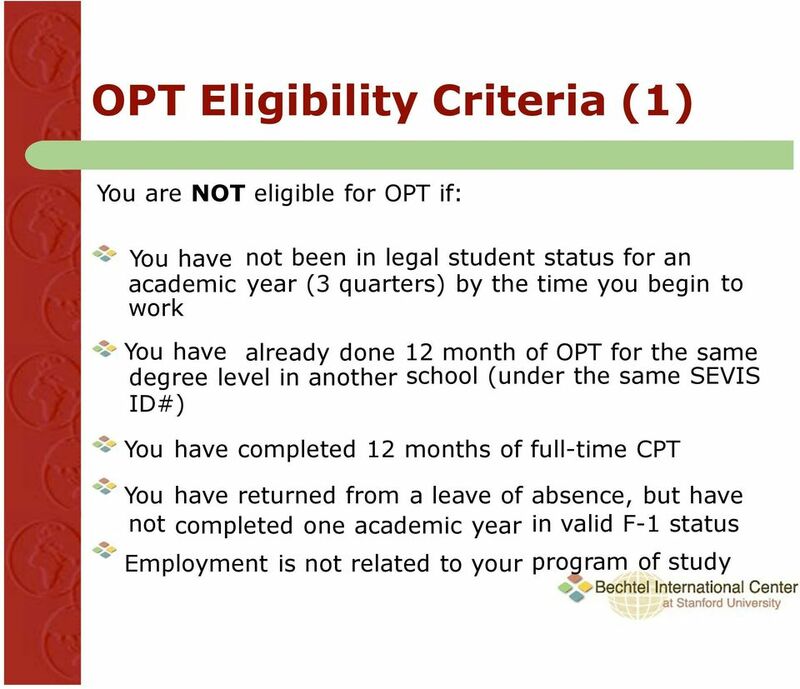 TGR students must enroll in 801/802 if participating in OPT during the academic year. 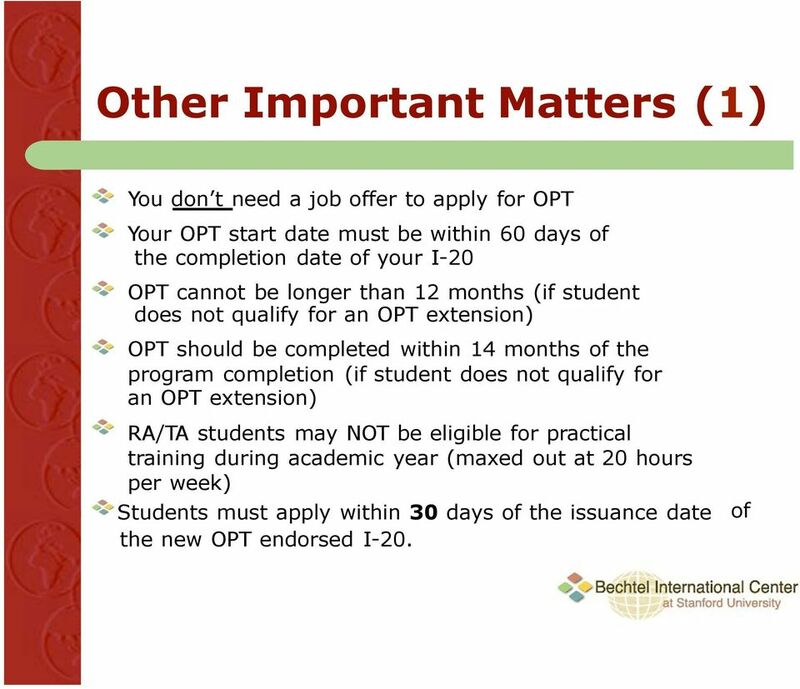 21 Other Important Matters (2) You may legally remain in the U.S. while your OPT application is being processed You cannot work until you receive your EAD card and the dates are valid You cannot take classes while on OPT except for incidental classes After graduation, you cannot work on campus unless you have OPT authorization (the job should be related to your field of study) You must update the secondary address in AXESS and subscribe to intl-student-opt mailing list. 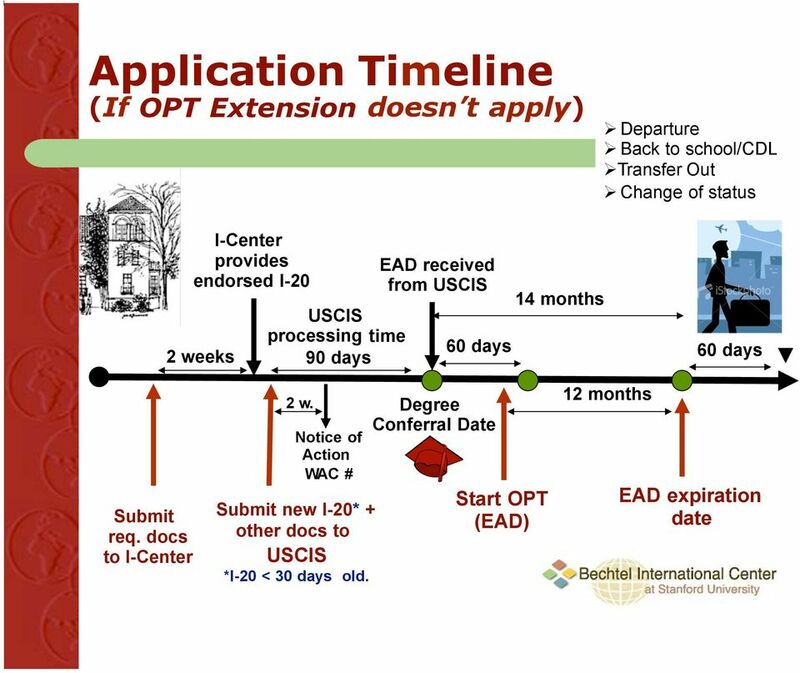 You have a 60 day grace period after your EAD card expires to prepare to go home, transfer to a new academic program in the U.S., or change your status. 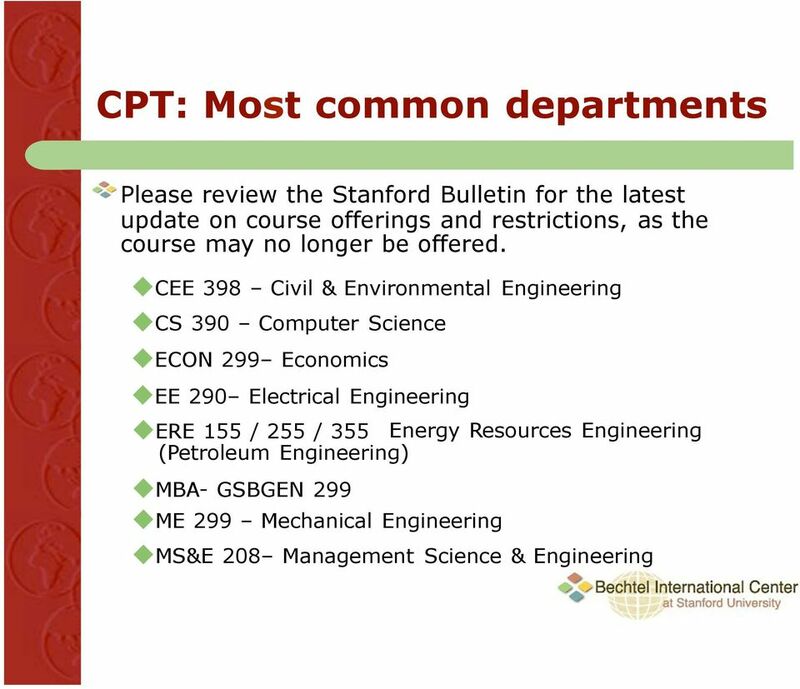 24 OPT Extension Eligibility Criteria (1) u Please check the following link for: Stanford Degree Programs that Qualify as STEM Degrees u Student must have a job offer from an employer registered with the E-Verify employment verification system. E-Verify is an Internet-based system operated by USCIS in partnership with the Social Security Administration (SSA) that helps employers to determine the employment eligibility of newly-hired employees. 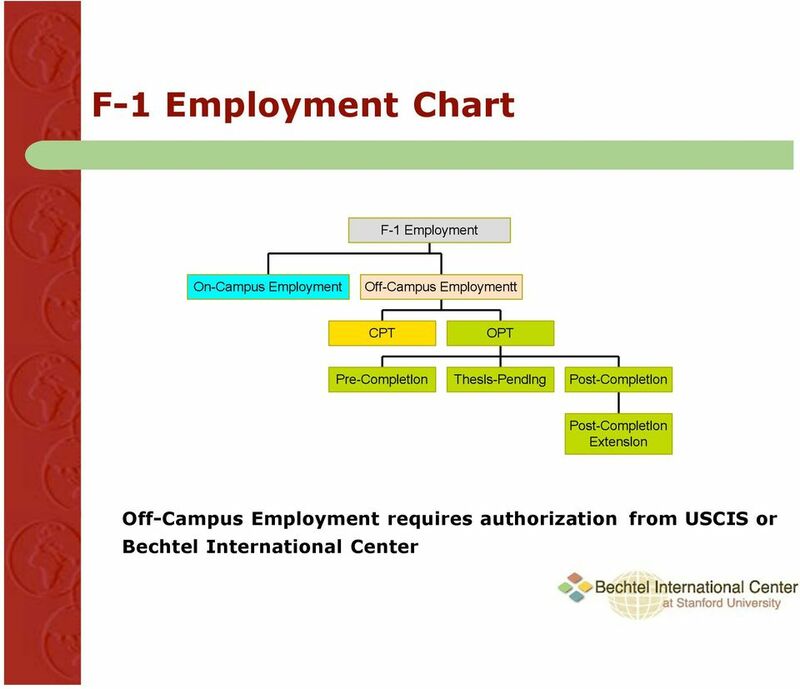 u E-Verify FAQ u Student must be currently participating in a standard period of OPT, working for a U.S. employer in a job directly related to the student s major area of study. 27 Other Important Matters (2) u Student will have to apply for the 17-month extension on Form I-765 with the usual supporting documentation, photos, and fee. u Students who timely file an application for the 17-month OPT extension will be able to continue employment while the extension application is pending, until a final decision on the I-765 or for 180 days, whichever comes first. 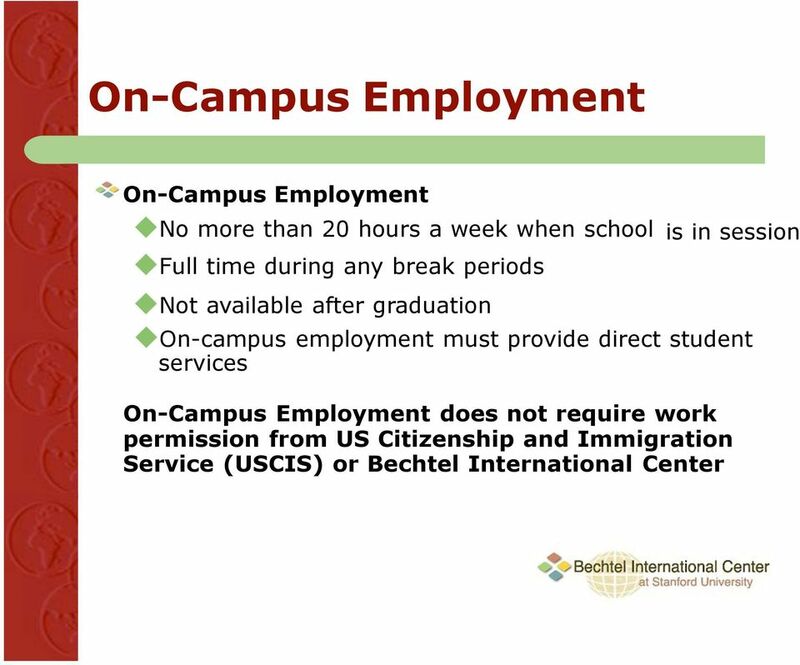 u The employer must agree to report the termination or departure of the student to the DSO or through "any other means or process identified by DHS." An employer must consider a worker to have departed when the employer knows the student has left employment, or if the student has not reported for work for a period of 5 consecutive business days without the employer's consent. 37 Notice of Action Has a tracking number the WAC # (Western Adjudication Center) which can track the application online. Has a received date (This is the date the CSC acknowledges receiving your application. The CSC can be contacted by the I-Center if the OPT has not been approved by 90th day from the received date.) Has a notice date (This is the date the CSC sent the Notice of Action letter to you.) If no Notice of Action is received 2 weeks after the application has been received, then contact the CSC at: and request that a Notice be sent to you. This Notice will contain the WAC tracking number for your case. 39 Security Checks during OPT processing OPT application may be subject to security check procedures and this may delay the processing time of your OPT application. Applications subject to security check procedures may be sent to Washington D.C. for further review. A security check can delay your application by 4-8 weeks, and sometimes longer The security check can not be expedited We have recently seen students from Iran and China (in sensitive fields) who have had delays in obtaining their EAD card in a timely manner. There is no way of knowing who will be subject to a security check You could be subject if you are: u Currently subject to NSEERS (National Security Entry-Exit Registration System) u Study in a field listed in the Technology Alert List u National or citizen of a country considered high risk to the U.S.
45 Case Study (1) Case 1: Can a student file for combined pre-completion OPT and post-completion OPT? Answer: u No. The new regulatory provisions differentiate between pre-and post-completion OPT in the application process and in the requirements for maintaining employment. 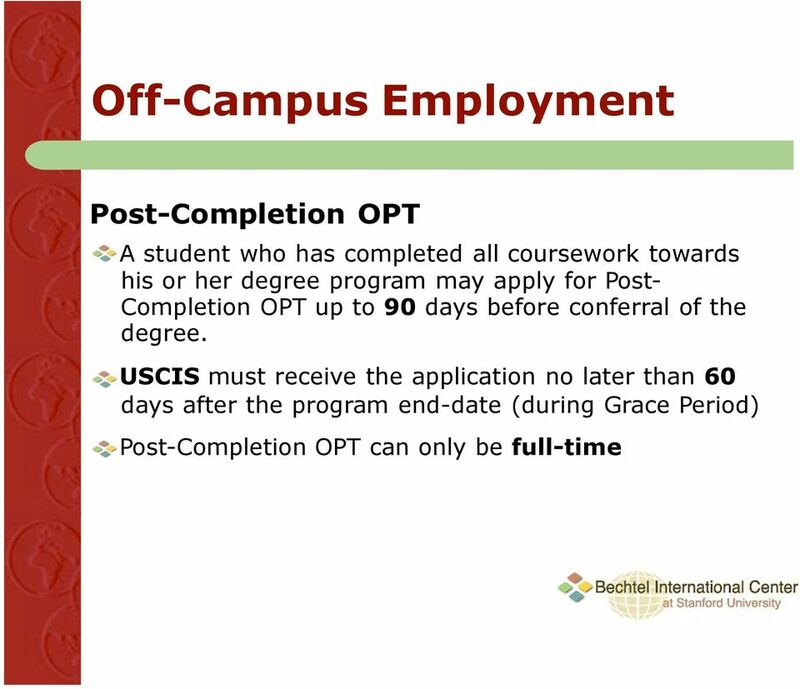 u The employment end date for pre-completion OPT is on or before the student s program end date. 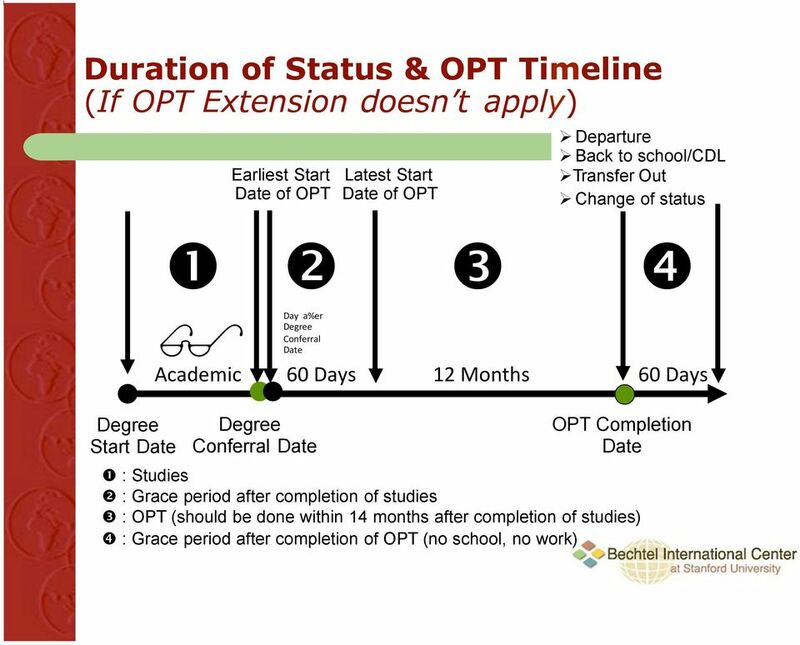 46 Case Study (2) Case 2: I am a Master s student, who has already applied for post-completion OPT. I just found out that I am not graduating this quarter. What are my options? Answer: u Apply for an I-20 extension immediately u If your OPT request has already been approved by CSC, you cannot work full-time but current interpretation of the regulation allows you to work part-time until you finish all of your degree requirements, and full-time at the end of quarter. u If the CSC has not taken any decision on your case, we can try to withdraw your OPT request. You won t get reimbursed for the I-765 application fee, and you have to re-apply. 48 Case Study (4) Case 4: I have already done 1 academic year at Stanford. I just registered for a CPT class and started to work off campus. I came to the I-Center to get a letter to apply for my social security number. I-Center told me that I can not apply, why? Answer: u You can not start to work if your I-20 is not endorsed for it. 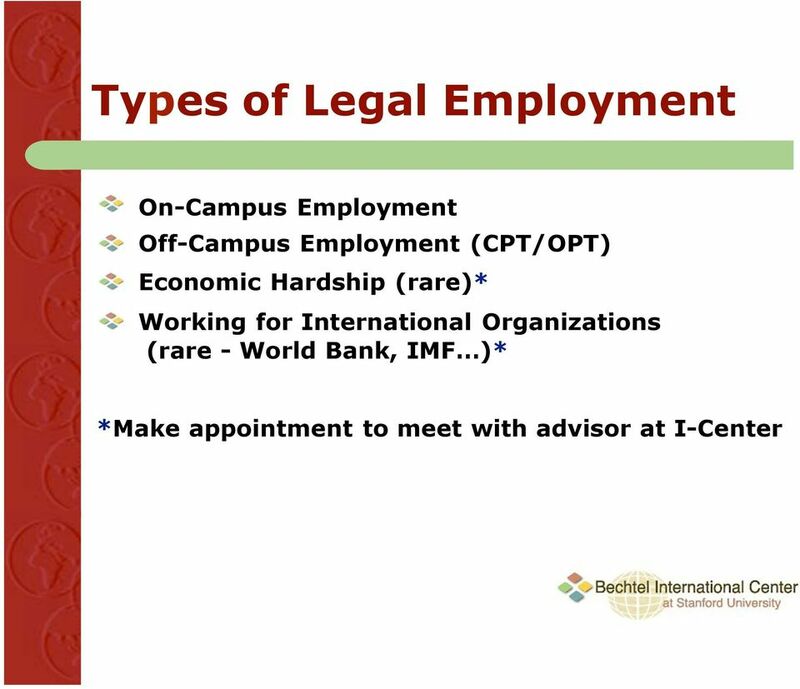 u CPT class enrollment is not enough to get the employment authorization. u You need to go to Social Security office with your CPT endorsed I-20 in order to apply for a SS#. In this case, letter from I-Center is not required. 49 Case Study (5) Case 5: I am a graduate student completing my degree in June. A company will apply for an H-1B visa for me in April. I am planning to start my OPT the latest date in August in order to be covered by next October when my H-1B will be effective. Can I work during my grace period (next September) while I am waiting for the start date of my H-1B? Answer: u Yes. 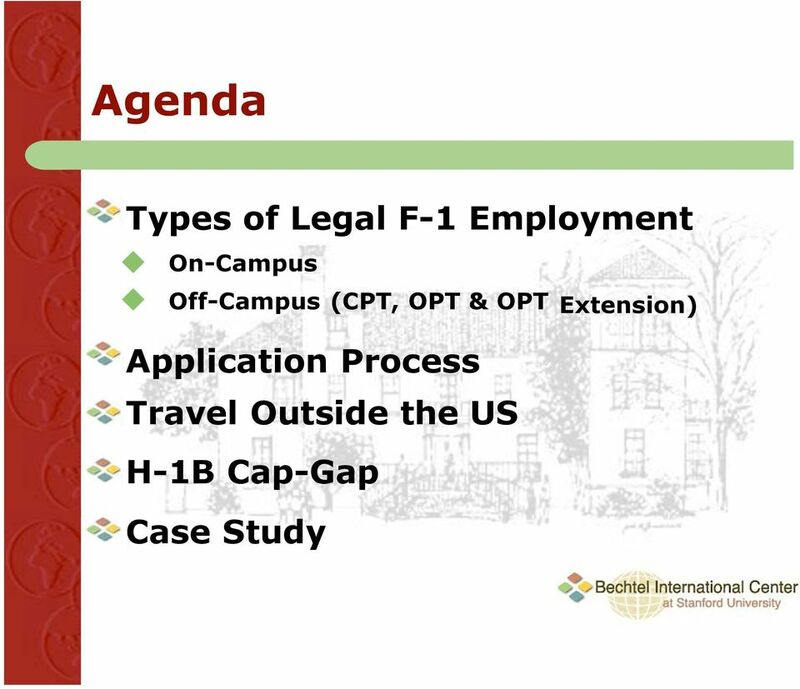 If your H-1B petition is either approved or pending, you can work during F-1 grace period. u If your H-1B is not approved, from August to October, you can stay legally in the United States, but you cannot work. F-1 STATUS AND EMPLOYMENT F-1 STATUS AND EMPLOYMENT Can I work? Should I work? Where should I work? When can I work? What s CPT? What s OPT? Curricular Practical Training What does the regulations say? Office of International Student Services PO Box 10078, Beaumont, TX 77710 Telephone: 409/880-8356 Fax: 409/880-8414 Email: international@lamar. 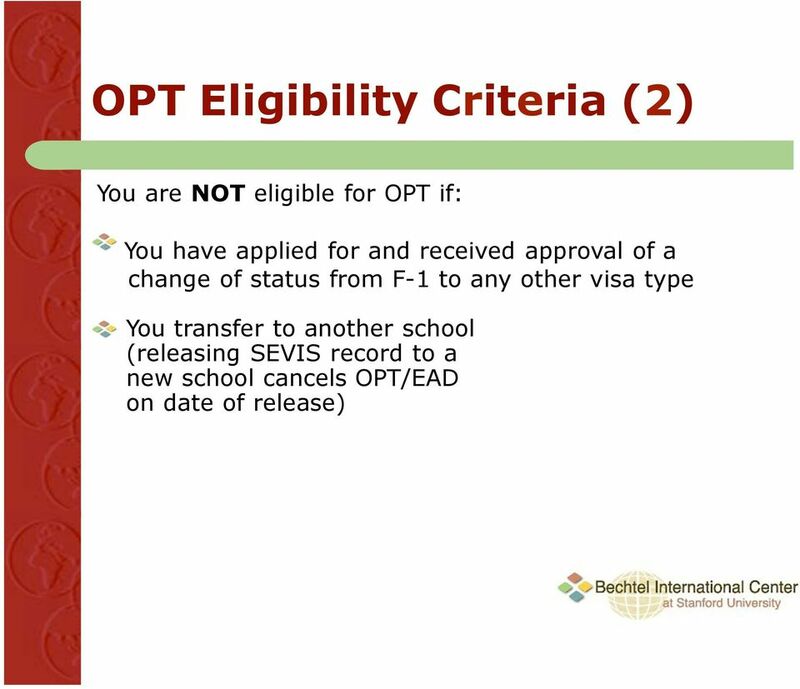 Rules and Regulations for 24-Month STEM OPT Extension Visa and Immigration Services (VIS) E5310 Melville Memorial Library Stony Brook University (631)632-4685 www.stonybrook.edu/visa What is a STEM Extension? 7/13/2015. 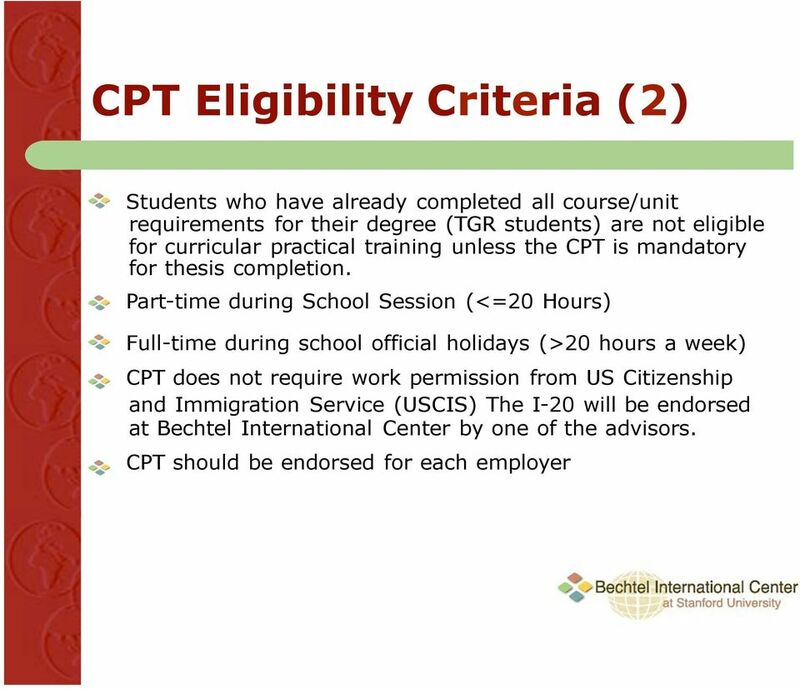 Regular OPT is temporary employment authorized by Immigration for 12 months and must be directly related to a student s major.